Customized artwork and collectible toys. The Archangels are hand beaded 3” custom munnys with angel wings. They come in black, silver and rose gold. 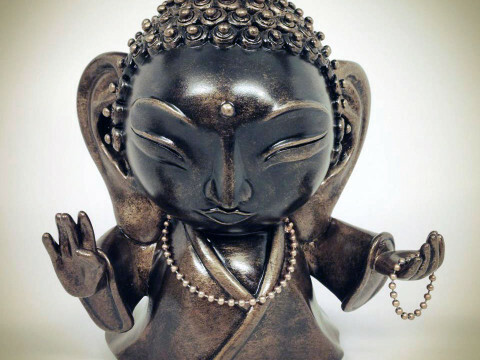 Lil Buddha is a 6” poly resin piece with only a limited run of 500. Sock Monkey is a 3” dunny turned into a sock monkey which has had an ear bit off by a dog. 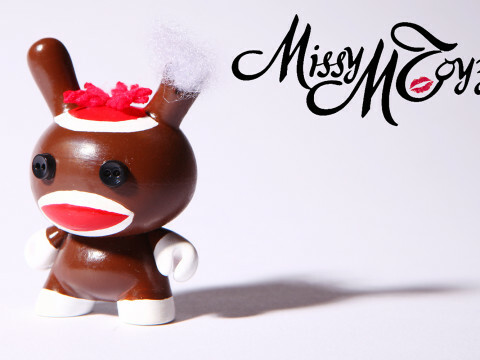 Sock Monkey was originally made for a dog charity event, Dunny for Dogs, which will be held at Kidrobot SF. Due to the high demand, I have decided to make a run of only 18 monkeys for this series. Each piece is hand painted and crafted by me. It has real button eyes, yarn hair and the stuffing from the ear is made from a dog toy stuffing.